Arrived in a rather dirty state in Srinagar. Stopped at the first place I saw selling fresh milk and downed half a litre. It's amazing how I miss the stuff! 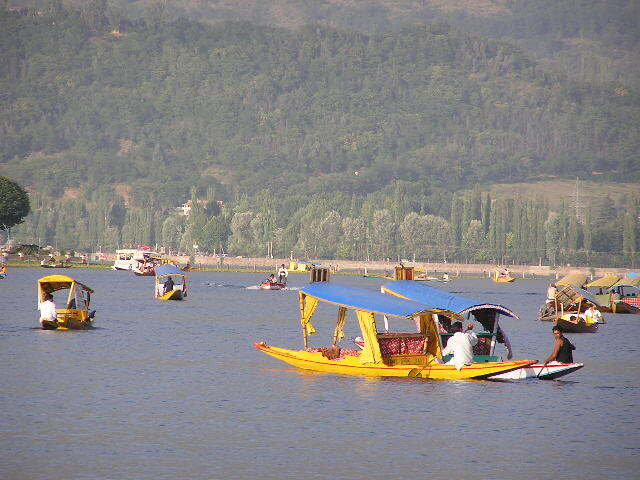 Anyway.... Srinagar is famed for it's house boats. The local rulers wouldn't let the Brits build houses so insted they made beautiful boats on the lake. I check into a houseboat in the city centre on the River Jhelum. It's not as scenic as the lakes but at least they are a honest family. The houseboats on Dal and Nageen lakes are full of shitster owners and scams are very common. 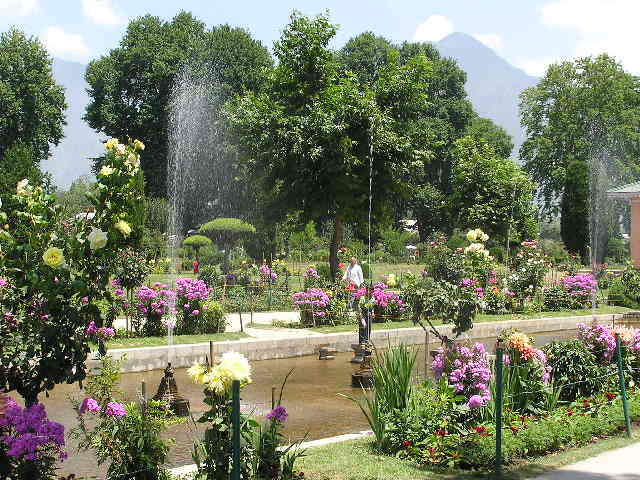 Srinagar has several beautiful and peaceful gardens. The Kasmiris are very different to other Indians. Many look more european than Indian. They are a little taller with a slightly better build and have individual hair styles. All the Indian men have exactly the same hair style! They are also snazzy dressers. Neat shirts and shiny shoes are the fasion here. BUT....unfortunately they have a very bad reputaion for being total slimy bastards and will tell any lie to get a sale. Many travellers (including myself) refuse to deal with them outside Kashmir! 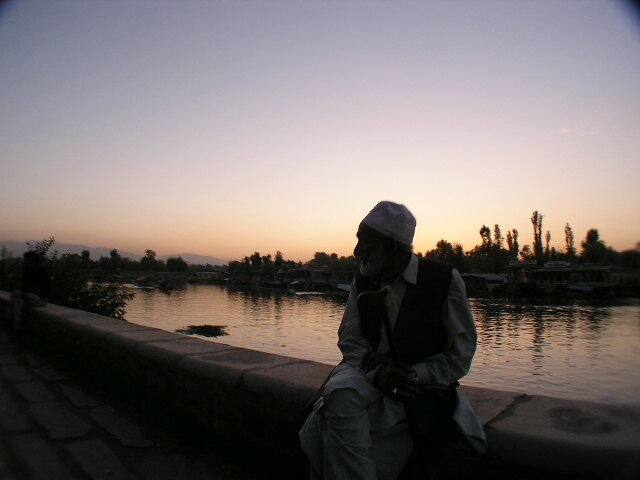 Sunset at Dal Lake, Srinager. I tell my house boat owner I'm from OZ. "Ah" he says, "I have good friend from OZ" and shows me a letter. I read it and it's dated 1974, 30yrs old! It's fading, falling to pieces, dirty yet is still treasured. The letter is like the story of Srinagar and it's houseboats. It's from a boom time when all the houseboats were new, full and sparkling. Now they're also fading and falling to pieces but are still very treasured. To be in one is to be in a time warp. You can easily imagine the "old school" Raj era Brits sat in the rooms enjoying the good life. Army patrol near the touristy Dal Lake, Srinagar. 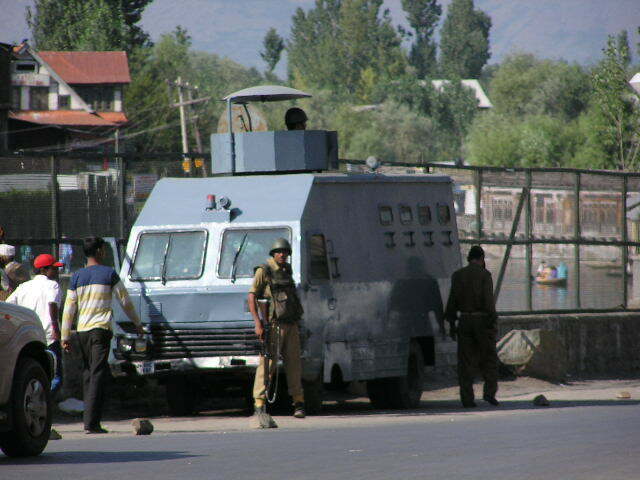 Many say that Srinagar is a town under siege. But I was here 4yrs ago and things are much better now. The place is still full of army but they have moved away from Srinagar into the outlayng districts. It's now possible to find a hotel here that isn't taken over by army. Kashmir is also now full (for 1 month at least) with Hindu pilgrims visiting the Amarnath cave to see the ice formed Shiva Lingam. Shiva is an Indian God, the destroyer. The Lingum is basically 'his tackle' and is worshiped in different forms throughout India. To me the Lingum is simply an ice stalagmite thats impressive but is about as exiting as an ice cube. Although I think anyone with a piece that size should be worshipped, especially considering it's ice cold as well! 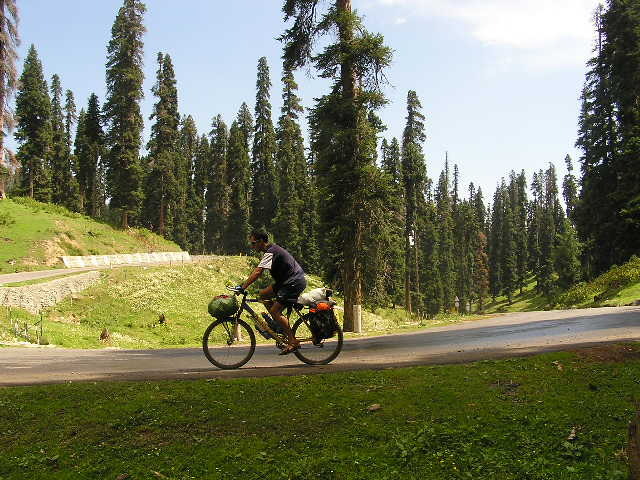 I head of upto Gulmarg for a day or two, it's only 60km from Srinagar and is a little cooler. 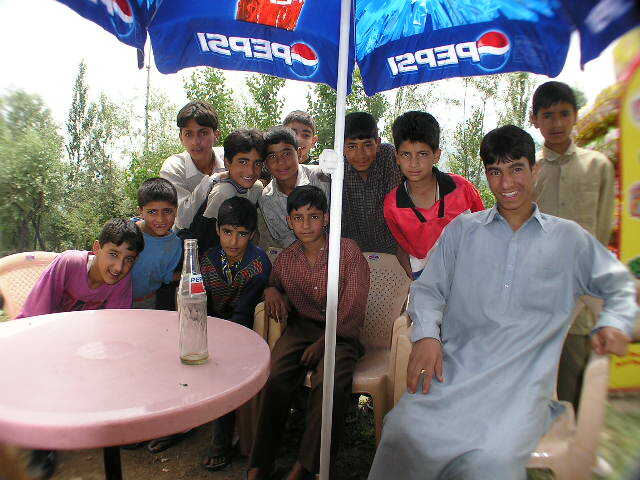 On the way I stop at a small deserted drink stall for a Pepsi and look behing to find half of the towns children are running up the hill to see me. I sit down and they all crowd around. I was ready for more begging but they all sat there like little angels. I'm told they are simply soo happy to see foreigners in the area. I drink up and leave. The slopes suddenly become lush and lined with pine trees. It's a beautiful place and I enjoy the switchbacks and I get the usual shouts and screams from the passing cars. The usual gathering crowd when I stop for a breather. There are many more behind the camera! As I approach Gulmarg I pass signs saying it's an offence to litter or horn in Gulmarg. Of course I arrive to see litter everywhere and everyone is blowing their horn. It's a shame because Gulmarg is a scenic spot, covered in trees and nesstled between mountains on three sides. After almost two pleasant weeks in totally friendly Srinagar I leave but take a shared taxi along the Kashmir valley. It's simply to busy with all the pilgrim traffic and also too damn hot. On the way security becomes tight and army patrols use metal detectors and sniffer dogs for hidden mines and explosives. The valley is very pleasant but a strange thick smoggy clouds hangs around the hill tops. I've never seen sky like this before!